How Do You Brainstorm for Quality Improvement? I brainstorm quite frequently in my job—whether I’m trying to come up with topics that are “blog worthy” or if I’m thinking of a creative way to write content promoting a new feature of Minitab. Sometimes I brainstorm alone, and sometimes I brainstorm with others during a meeting. Sometimes I brainstorm in a structured way by sharing ideas with colleagues in a circle, and sometimes I just throw ideas onto a sticky note. I studied advertising in college and I even spent one summer interning at an ad agency, and brainstorming sessions were built right into the nuts and bolts of the creative process for coming up with the ads. I was recently reading this article that talks about the foundations of brainstorming actually beginning in advertising, and I found it interesting that brainstorming has spread into virtually every discipline—including Lean Six Sigma and other process improvement methodologies. While there have been varying opinions about the worthiness of brainstorming, especially in group settings, I think it’s really a fundamental part of any problem-solution scenario (which encompasses so much!). Whether I’m making a list of goals and requirements for new website content, or thinking about how I’m going to pack 10 days worth of clothes into a piece of carry-on luggage without going over the 40 lb. limit, I’m either making lists of potential outcomes or physically coming up with and testing different combinations. These are both techniques I’ve used in brainstorming to solve problems. Quality improvement experts often look at brainstorming in the same way, using it as a method to lead them to potential reasons for a product or process defect. Sometimes Lean Six Sigma teams will meet and use structured tools, like fishbone diagrams (also known as Ishikawa or cause-and-effect diagrams), or even just a pen and paper to brainstorm. Fishbones let you brainstorm possible causes or a problem and see relationships among potential causes (this is especially beneficial for manufacturing). Use the green boxes to represent categories of causes. The idea map is helpful for structuring and organizing your brainstorming results. The central question or main idea is in the center. Use CT (critical-to-quality) trees to identify and organize inputs for a critical-to-quality characteristic. 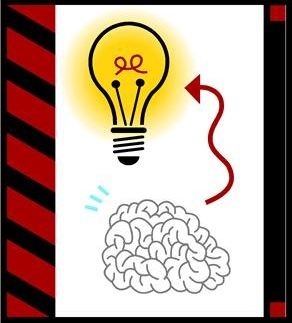 How do you use brainstorming in your quality improvement projects?